The spark that lit the most recent rebellion was an announcement by the Haitian Prime Minister Jack Guy Lafontant that gas, diesel and kerosene prices would be raised by 38-51%. 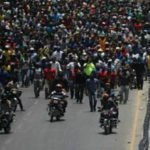 Haitians took to the streets en-masse across the country. 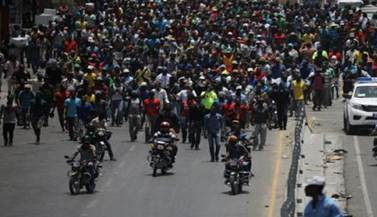 After just two days, the growing grassroots mobilization forced the government to rescind the gas price increases. But the protests escalated into a two-day general strike, barricades blocking streets and highways in cities throughout the country. PM Jack Guy Lafontant resigned but it was too little too late. The Haitian people are demanding the removal of the US-backed and fraudulently-elected president Jovenel Moïse. Government corruption including the theft of $3.8 billion from PetroCaribe by officials – those named include two former prime ministers as well as heads of private firms in Haiti. Ongoing attacks on Haiti’s grassroots majority, including the burning of public markets, targeting market women; government land theft and demolition of homes; teachers not being paid; attacks on student protesters; and the violence of poverty – 59% of Haitians live on less than $2/day, 24.7% on less than $1.25. Ongoing repression. As of July 6th, independent media on the ground Radio Timoun reported five people killed and many wounded by gunfire by police and government-sponsored paramilitary; more protestors have been killed or injured since. Independent media including Radio and Tele Timoun have been vital to spread the news of what is actually going on rather than spouting the US Embassy/Haitian government line. Independent Haitian journalists have increasingly been targeted and some killed for reporting the truth and giving a voice to the people’s movement. Donate to support independent GRASSROOTS MEDIA IN HAITI, so it can continue to share news and information among people in all parts of Haiti, and with the rest of the world. Make a tax-deductible donation to the Haiti Emergency Relief Fund using the ‘Donate’ button. HERF’s fiscal sponsor is East Bay Sanctuary Covenant. Stop the Repression. NO NEW ARMY!